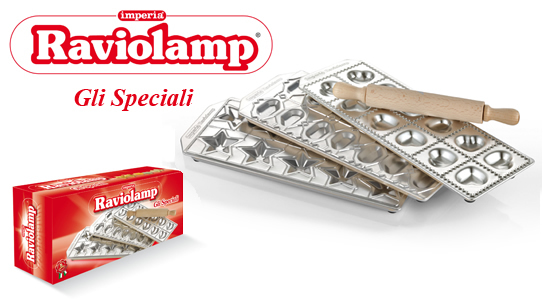 IMPERIA Raviolamp "Gli Speciali" is a package containing three moulds for ravioli. The moulds are shaped of little stars (56 x 60 mm),of little fish (65 x 40 mm) and of little hearts (52 x 52 mm). Inside each pack you will also find a rolling pin in beechwood very pratical. Click the button below to add the RaviolampTris Speciali Ravioli Mold Set of 3 made in Italy by Imperia to your wish list.